FFA officers pose for a picture at the great stateline of Oklahoma. Each year, FFA holds a national conference for all of its members. Greeley West’s FFA raises funds to allow its officers the opportunity to experience the converntion in Indiana. This year’s officers left last Monday and the roadtrip through middle-America began. 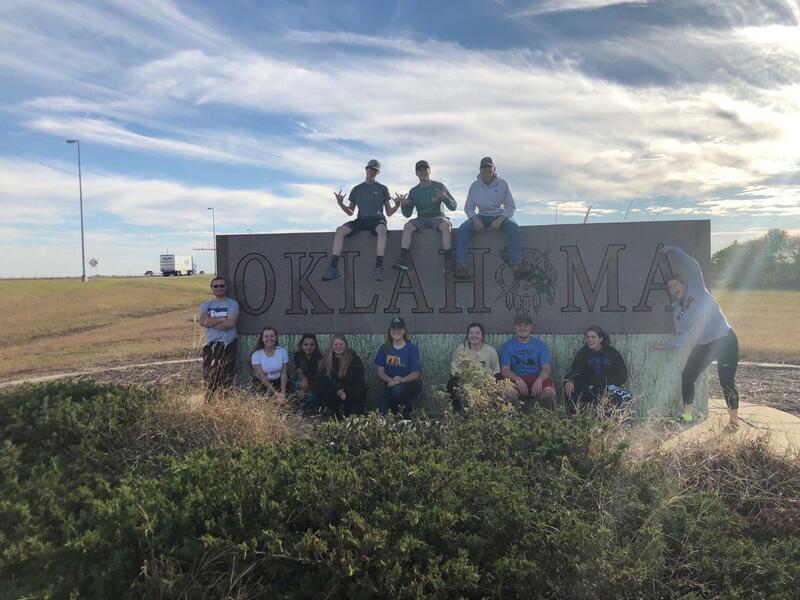 The roadtrip is important because it gives students the chance to look at colleges and interesting all-American stops on the way to the national FFA Convention. The student travelled to Kansas, Arkansas, Oklahoma, Kentucky, Tennessee, and Indiana. The students were given the opportunity to visit Oklahoma State University and Purdue University. The staff that is in charge of organizing the field trip and watching the students is Mr. Kelly Longarce an agriculture teacher at West and Chris Ewing, who is a father to one of the students in FFA. The trip is seven nights and eight days. The students travelled in two cars that hold up to eight passengers and up until Thursday the students stayed in different hotels because they travelled every day. Senior Ashley Adamson participated in this trip. “It’s important because the people on the trip are mostly officers so it’s cool to bond and be surrounded by a sea of blue and we all feel the same passion of being Ag advocates,”Adamson said. At the convention the students attend sessions that have leadership workshops, speeches about how to be accepting in life, and how to problem solve when things do not go accordingly.